I recently resolved to make a day-long tour of all of the markets on the Celebration server, in order not only to familiarize myself with their locations and the routes between them, but also to get a sense of the extent and variety of the merchandise on the server. First, it should be noted that every market I visited is located on or very near the shoreline, and I almost never found myself more than 20 tiles from my ship. This fact along with the abundance of interior and exterior shoreline, and the existence of good canals makes Celebration an exemplary server with respect to the abundance and ease of travel between its markets. Rather than traveling over large and dangerous land passages to one central marketplace, the markets on Celebration are situated relatively close to population centers, and with the possible exception of the southern and southwestern shores, no matter where you are on the server you are pretty close to a market. My trip began at location 0, my home port of Wealdin Anchorage, which is not a market, but which is situated near the center of no fewer than 7 market destinations. It is a good place for a merchant to call home. I sailed west and then southeast to my first stop, Golden Market. The lore surrounding Golden Market is mixed and mysterious. It is fairly well agreed upon that the founder of this market has passed away, and that loss hangs heavily upon the place. Someone clearly has maintained the deed, and there were half-rotten bulk storage bins by the piers. I repaired everything while I was here, and made a note to bring tools for improving all of the stands when I come here next. When I sailed in, it was in the dead of the night, and I was immediately aware of how dark and gloomy the place was. On the deed beside the market stood imprisoned the venerable starving Kyklops. A site to behold. Lamps sat cold and lifeless amid the market stalls, likely gathering cobwebs. I was attacked by several waves of spiders upon first entering the market square. After dispatching them, bandaging, and burying the corpses, I set about inspecting the merchandise. Without doubt, the Golden Market currently has the best and most comprehensive stock of weaponry and armor on the Celebration server. In terms of quality, variety, and practicality, I was very impressed by the merchandise. The Golden Market is a dangerous place where dangerous people go to buy dangerous things. The idea of an all-in-one market is appealing on many levels, but not nearly as appealing as a grim, haunted place where you go to find some of the best armor and weapons on the server. It would be a fitting tribute to the founder of this market, should the master weaponsmiths and armorers of Celebration, present and future, choose to make that its legacy. I sailed east and then southeast to my second stop, the Tapdance marketplace, which spontaneously emerged this summer in the perimeter north of Celebration's default spawn location. Since it is owned by nobody and not on a deed, I found the market stalls in advanced stages of disintegration. Several were missing, leading to gaps in the market where new merchants cannot presently be placed. The Tapdance market is the only one of the locations I visited not within sight of the water. Still, it's a short walk north from the shore, up a very gentle hill, and another dozen tiles or so to reach the merchants, so it is no great hardship for visiting sailors to transport their wares here. In addition, the area around Tapdance is at the confluence of several very well designed highway systems that lead out into the wider world, so it is a natural center of overland trade and transit. There are also several traders in the vicinity, and an abundance of trading post buildings with vendors inside of them. Some carry quite rare and impressive items, making this patchwork market worth the visit for deal-seekers. Most of the merchants dealt in the ubiquitous ropes, sails and anchors which, likely owing to our geography, are probably the single most common class of items sold on merchants on our island. There was also a small assortment of weapons and armor suitable to new players and advanced players. The most noteworthy and helpful vendor I found there was one that sold almost one of every single thing a new player needs in Wurm. Seeds, cotton for bandages, healing covers, a lantern, very basic armor, and modest upgrades to all of the starter equipment, as well as some things that should be starter equipment like a sickle. None of this was mind-blowing gear, but all of it was useful to new players. Overall, a very considerate and helpful merchant. The first thing I noticed sailing into AP Market, which has built a reputation as a sort of mercantile Mecca on Celebration, was the enormous flotilla of ships moored in its harbor. Which and how many were for sale was impossible to gauge at a glance, but I imagine quite a few. Amish Paradise Market has a very convenient and well organized bulk vendor merchant pier, with more capacity than I've seen at any of the other markets thus far. All of the bulk goods piers were designed such that deep hulled cargo vessels could easily pull up and load or unload cargo without requiring additional transport. The well stocked merchants at these stands sell keys for the various bulk item bins, making it possible to conveniently exchange massive quantities of bulk goods here. Amish Paradise Market is easily the most vital market on the Celebration Isle. You can buy nearly anything here, from high quality livestock to ships. With dozens of vendors, and nearly every market stall occupied, you can find almost everything you want at this market, and perhaps even some incredible deals. The most noteworthy exception to this was (at the time of this writing) high end weaponry and armor. AP Market seems to be underserved in this respect. There is a lack of sufficient quality and variety of weapons to satisfy demanding customers. However, there was at least one stand filled with an impressive selection of working tools. These are not tools for people who are interested in grinding skills, but for people who want to get real work done quickly. High quality, high speed tools for busy craftsmen and dedicated landshapers. The size of the market and sheer number of vendors means there is a lot of overlap in inventories. Thus, a newcomer to the market might spend a considerable amount of time digging through row after row of vendors, only to conclude that nobody is selling what they're looking for. This can be frustrating, and might possibly be eased if more of the vendors were more precisely and descriptively named. However, none of this can detract from the main strength of this crucial and powerful economic center, which is its active, lively, and helpful community and its strong leadership. Amish Paradise Market seems positioned to remain the center of commercial gravity on Celebration for a long time to come. This merchant has had a mixed and trying experience with the Straits of Kami. As the natural crossroads of maritime traffic between the eastern coasts and the interior waterways, and foot traffic from the northern to the southern parts of the island, Kami sits atop a seemingly perfect piece of real estate for a market. However, its vastly overbuilt market strip evokes the feeling of desolation and desertion. There are, by some estimates, more market stalls at Kami than there are deeds on the Celebration isle, so it should come as no surprise that the place feels empty. And in commerce, perception is reality. There were a handful of brave or vigilant merchants along this corridor, doubtless there to serve the local foot traffic that crosses over the landbridge connecting the northern and southern landmasses. This landbridge hinders traffic for any deep-hulled ships that cross it, requiring passing sailors of corbitas, cogs, and caravels to push over one tile per unit of length of their ship. 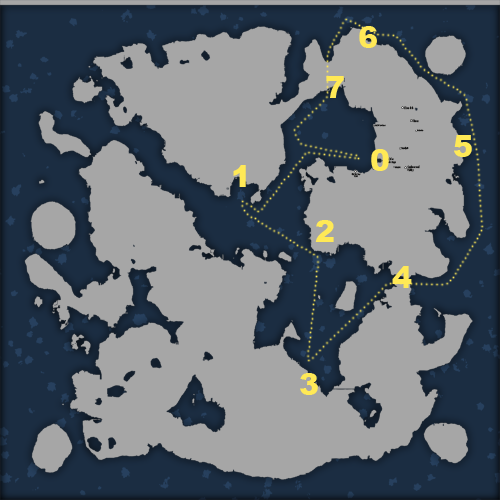 Knarrs and smaller vessels are unimpeded by this landbridge, but it is a hindrance for bulk merchants sailing through the location. This almost certainly contributes to the large number of empty merchant stalls. Overall, I found the merchandise at this market lacking in volume, diversity, and in some cases overpriced. It might still be worth a stop if you're seeking something rare and difficult to find, and have exhausted your other options. Perhaps in the future, as the population of Celebration grows, the abundance of market stalls here will prove to be of use, and it will blossom into a vibrant market in its own right. It already has the perfect location, but it might take a radical conceptual redesign to make the most of that asset. This avante-garde boutique market is conveniently located halfway between Kami Market and Northern Sanctuary, making it a good place to stop and quench your thirst before continuing on. Owned, designed, and stocked by a single craftsman, Da Boneyard can offer a unique shopping experience you are like to find nowhere else on Celebration. There are four vendors (with room for more). They each are clearly labeled, and they each sell very specific types of merchandise. Weapons and Shields, Armor, Gems, and Tools. All of the merchandise is of reasonably good quality, and is reasonably priced. Do to Da Boneyard's unitary crafting base, there isn't a tremendous variety or quantity of merchandise, but the most important and attractive thing about this market is that you will know within 30 seconds whether the item you're looking for is available. Get in, get your stuff (or not), get out. Easy. Reliable. Right on the coast, no messing around. Items of Iron and Stone. For type-A personalities who set out to buy something specific, know what they're looking for, and don't want to sift through stand after stand of random stuff, this is a breath of fresh air in market design, which other markets would (in this writer's opinion) be well served to emulate. While Amish Paradise is the most vital and active market on the server, Northern Sanctuary is easily the most visually arresting, beautiful and supernatural feeling of all the markets I've toured. The harbor is home to a prismatic array of brightly colored merchant vessels. Flags and banners of every kind and color stand sentinel along the shore. The buildings, the lights, even the barrels and storage bins are all awash in rainbow hues. The modestly sized market is up a short stroll up from the seaside boardwalk, situated among the vineyards and near a beautiful multifaith chapel courtyard. These merchants were stocked with a modest variety of high end, enchanted tools, armor, and weapons. There was a vendor selling extremely well bred horses, and, very noteably, another one exclusively selling high quality hides. There is an outdoor museum of "Hunt of the Ancients" statues here, relics of older times that may not know their equal anywhere in the Freedom Isles. For these and all of the reasons above, sailors and merchants from everywhere on Celebration should make at least one voyage to this market, which is without a doubt our northern jewel and certainly the loveliest deed I've ever seen. From Northern Sanctuary, I turned my bowsprit south and made a fast run through the depths of the Ridgepoint Canal, which connects the northern seas to the wide and shallow waters of the Northmere. Here I made my final stop, at the Ridgepoint Market. Ridgepoint Market is the main commercial hub of the Ridgepoint Alliance, which includes a host of northern villages. It is modest in size, about equal to Golden Market, and it is home to a modest variety of tools, weapons, armor, and carpentry items. Some of these tools and weapons were of excellent quality, equal to the demands of the wild and mountainous North. Some were lower quality and priced for bargain hunters. Ridgepoint, due to its location between the northern seas and the interior lakes of Celebration, may have stolen some of the wind from the Kami Market in the southeast. The people who built this most impressive canal are crafters and miners of skill and determination, and are obviously capable of fine metalwork equal to the mountains they have tamed. This concludes my account of the markets of Celebration. These landmarks will almost certainly shift. New markets will rise and others will fall. Deeds will trade hands. But each of these markets contributes something vital and important to the commercial tapestry of our island, and taken together they make Celebration an economic powerhouse in the Freedom Isles. After seeing what I have seen today, I am convinced that anything I want can be had on this server, and that each market could greatly benefit from additional merchants and increased specialization. I had wondered if I would find this very post soon after your tour ended.. and here it is. You are most welcome, and I will certainly return again. Thank you for the hospitality! the golden market deed is going to disband,it just had a lot of upkeep when jaljang died,he wasnt the founder the just happened to have the deed on him when that happened,several people,including him and me founded gm,and none of those people want to live there after that. Wonderful write-up, I enjoyed it a lot. I think you gave good feedback to merchants of all kinds trying to find a niche in the market - there are obviously plenty to be had! As long as there are merchants in the stands at Golden Market, and as long as any current or future mayor does not wish for it to be otherwise, I will donate to maintain its monthly upkeep. It's the only major market reachable by foot in the Northwest, and it just feels like the right thing to do to keep it alive, in memoriam. I've got merchants at Kami and TD, oddly enough, the ghost town Kami (and it does have that appearance) sells a lot more. Hassle to refill merchants anywhere though, we need a system of refiling via the form rather than in person, in my opinion. I think it only seems like a ghost town because of how many empty stalls there are, and that really isn't because people left it, but because it hasn't undergone its major boom just yet. Given time, bridges to speed shipping, and TLC by its owners, I'm sure it will outgrow this phase. Well, the owner is on Inde now so I wouldn't expect anything to be changed anytime soon. Odd we don't have any markets in the West (apart from the Midgard Trading Post which is bulk stuff I think). Nice guide, Garis, well done! From my "tours de markets", each of them has something to offer, including Whispering Glade (already disbanded) and two-stall Korner Farms. And if you have time to browse endless lists of items, you can sure find some bargains everywhere! Now, for some geekitude. I realize "cÃ©lÃ©bration" is not a masculine noun, and that the title of the post is probably making native French speakers cringe. I apologize for that. Would "De La Celebration" be more fitting? I'd like to offer some support on this as well. I had wondered what was going on there, but with the additional information provided, it tips me in favor of the active support. Is there any way to transfer the deed to another player in this case, maybe by use of the election feature? If so, and the current deed population agrees, I'd like to offer to either buy the deed outright (depending on cost as I'm not sure to the size of it), or at the least drop a few silver into the upkeep pool as well. afaik none of the villagers of golden market that are still there,are active players anymore. Just want to comment that you have done an excellent write up here about a trip to these markets from a boating perspective. Your descriptive writing style had me reading about each marketplace with interest, as the market environs were creatively enhanced by your well worded perspective and point of view. Although I doubt I will ever set foot upon Celebration due to my abhorance of the snail pased boating travel system enforced upon us Wurmians, from your post, I did still get a glimpse of the lure of these fine marketplaces and their contribution to the wonders of that far off Celebration server. Always good to read your constructive posts upon these forums. Well done! Thank you, it was a fun trip. I'll try to make it a similar one at least once each month, updating this guide as the markets evolve, and adding info about new markets (including map updates) as they spring to life around the island. yes, i am on indy now ( kami markets owner). and until landbridges are in there is def no need for me to be there, listening to ppl complain i made it poss. for everyone to get across that blasted canal. I'm confident Kami Market's best days are still before it. I dont live on celebration but I wouldnt mind tipping my bank a bit to keeping the upkeep of GM going in memory of a founder and as a possible booming market place in the future. If anyone who lives on celebration is trusty enough I can tip my bank to let me know as I dont forsee me sailing down there for some time. Excellent. I'll include it on my next merchant voyage, which will probably be on or around Black Friday, and include it with my updates. I am of reasonably good character, and would be happy to handle it. We can work out the details in a PM. I do mostly bulk goods here, and the deed is under construction; but I do have a market place set up, Just need people to place merchants.